NWTRCC’s 35th year began with a ﬂurry of new inquiries from distressed taxpayers facing the January inauguration of the current president. As the only national organization that offers solid information about this act of civil disobedience, our website and social media feeds were prime sources, and thousands learned a lot about war tax resistance (WTR) even if it was not their primary reason to consider not paying. 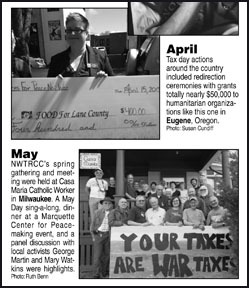 The war tax resistance network was ready when the November election brought renewed interest — thanks to the steady support of NWTRCC by donors and volunteers. I won’t pay a dime for this mess. or the empire of the US. 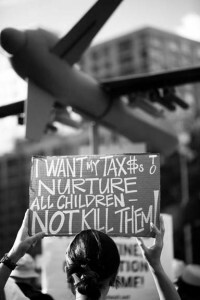 War tax resisters take seriously the message “I want my taxes to nurture all children, not kill them.” We believe a world without war is possible, and we want our money and resources used to create that world. 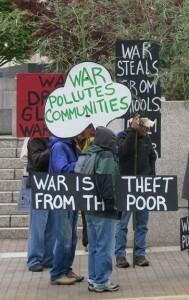 The National War Tax Resistance Coordinating Committee (NWTRCC) exists to connect and support all the activities that are part of withdrawing support from war and encouraging others to do the same. 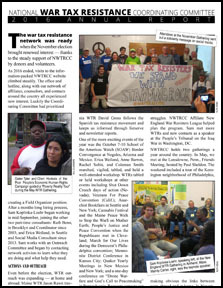 From individual resistance to mass action, NWTRCC provides tools to strengthen and unite our message. 2013 set us on a path to look at our strengths and weaknesses, tactics and emerging trends to make war tax resistance (WTR) a known and viable option for more people.